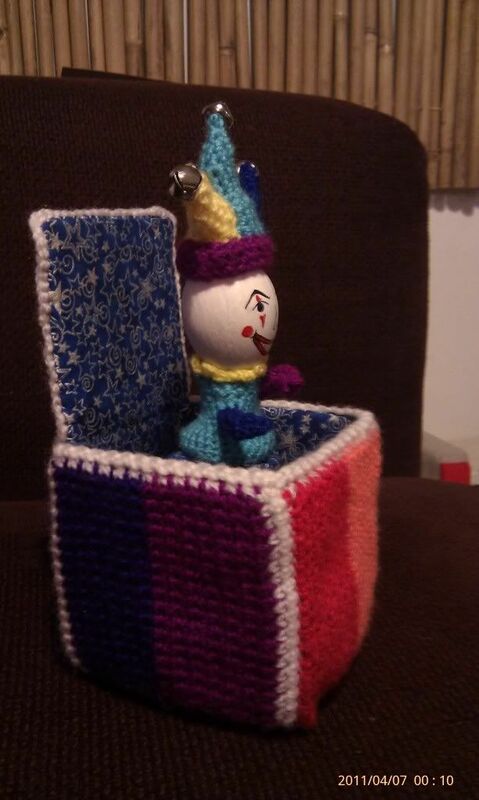 As an entry to the school egg decorating competition (the category for parents and teachers), I’m doing a crochetted Jack in the Box type idea, with the egg made up as the ‘Jack’, and the crochet box lined with starry fabric. It’s a work in progress at the moment, and I’m afraid I haven’t been taking very detailed progress pictures, but will be posting what I’ve got with some explanations as I get the time. As with many of my projects, my method is a bit cobbled together and made up as I go so not to be taken as the best way. This is more as a reminder to me, and as the basis of an idea for others… I hope! Very Cheap Acrylic DK yarn in 8 rainbow colours + white. Small block of wood, spring, screw, nails and suction cup to make the bouncy bit. In first colour chain 19, then starting in the second chain from hook work one DC into each of the next 18 chains. Ch 1 and turn. *Work the next row of 18 DC stitches. Ch 1 and turn*. Repeat *-* until you’ve finished all 4 sides and edges. Each side has 13 rows of each of 2 colours (so each side ends up 18 stitches high by 26 wide), and each edge is 2 rows of white. You could obviously do yours sinlge colours, or wiht more stripes, but I really like the effect of the contrasting edges on the finished box, so would keep that in. Continue until you’ve finished all 4 sides, and end with the 4th double row of white. You now have a long, rectangular striped piece of double crochet, which is a total of 18 stitches wide by 112 long. Slst the ends of your piece together so that the join only shows on the inside. [need to add pics etc. for how I do this here]. Don’t cut yarn yet! I didn’t worry to weave in the yarn ends as they’ll get hidden inside the lining, but I did knot them off so that they don’t come loose. Round 1: HTC 2 tog all the way around (56 HTC in total – need pics for technique), slst to join to first HTC of the round. Ch 1. Round 2: DC in each stitch all around, slst to join to first DC of the round and fasten off. Now hook onto any stitch along the bottom of the piece and repeat the white edging (one row of joining HTC and one row of DC, slst to join and fasten off). Now for the bottom of the box. 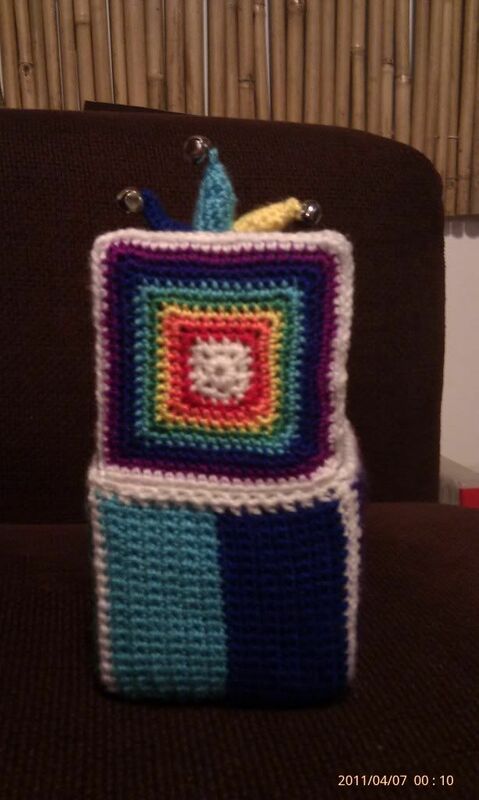 Using white yarn, I worked up a simple square using my pattern here (add link). I worked X rounds in total, but didn’t fasten off yet. Matching up the corners of my square to the white edges of the box, I slst it onto the bottom of the box. I did this by slst each DC stitch on the square to a stitch on the bottom of the box, except at the corners, where I slst the 3 corner stitches on the square into the single stitch which corresponded to an edge of the box. Again, I did this so that the join shows up more on the inside. Fasten off and don’t bother to weave in ends unless you really want to. Starting from the corner, slst the corner stitch of the square to the end of the white edge of the box. Slst the next 2 stitches of the side of the square to the next one stitch of the top of the box. *Slst 1 stitch to 1 stitch, then slst the next 2 stitche of the square to the next single stitch of the box*. Repeat *-* until you get to the next corner, make sure the corner of the square is joined to the top of the box edge and fasten off. I crochetted the hat in 4 different coloured parts, starting with the middle point. Round 1: DC in each chain around the ring (18 DC), slst to join. From now I worked in concentric rounds (i.e. I didn’t finish off each round, but just kept going round + round. Round 13 to end: DC in every other stitch, skipping alternate stitches + keep going until you’ve reached a good point (3 or 4 DC to the end). Pull yarn through to fasten off and leave a long tail. In each of the other two colours (royal blue and yellow), start with a long tail of yarn (for sewing these on later), chain 12 and join to make a ring, then complete as above, starting from Row 5 and working through to the end. Use a darning needle to sew each extra ‘horn’ onto the original hat, and then make the brim. To make the hat brim, I used colour 4 (magenta purpley colour). Chain 21 and starting in 2nd chain from hook work 1 DC into each chain (20 DC). *Chain 1, turn and work back along the row (20 DC)*. Repeat *-* once more and then slst the ends of your little length of DC together into a loop for the hat brim. Fasten off with a long tail, and darn around the edge of the hat to help hide the joins of the horns. Finally use the yarn tails on the horns to sew a little pom pom or bell onto the end of each horn and weave in the ends. Body: Ch 15 + join ring. continuous rounds – round 1 + 2: DC in each (15 dc in each round). round 3 *2dc inc,dc in next 4* rep *-* x2 more (18 dc). round 4: dc in each (18dc). round 5: *dc in first 2, 2dc inc, dc in next 3* rep *-* x2 more (21 dc). round 6: dc in each (21 dc)…. continue pattern increasing +3 dc stitches in each other round, moving increases around so they don’t make the whole thing triangular. Once increased to 30, do 2 rounds of straight DC (30 DC in each round) and fasten off. Collar: join in at back top edge. *DC in stitch 1, ch 3, DC in stitch 2* repeat *-* (1 Dc in each stitch with ch 3 in alternate gaps). Cut 6 squares of cardboard, about 10-10.5cm square. Tape together in a cross shape using gaffer tape on both sides of each join + leaving a 5mm gap between each square. Put card template on fabric and draw round, leaving a 1.5cm seam allowance. 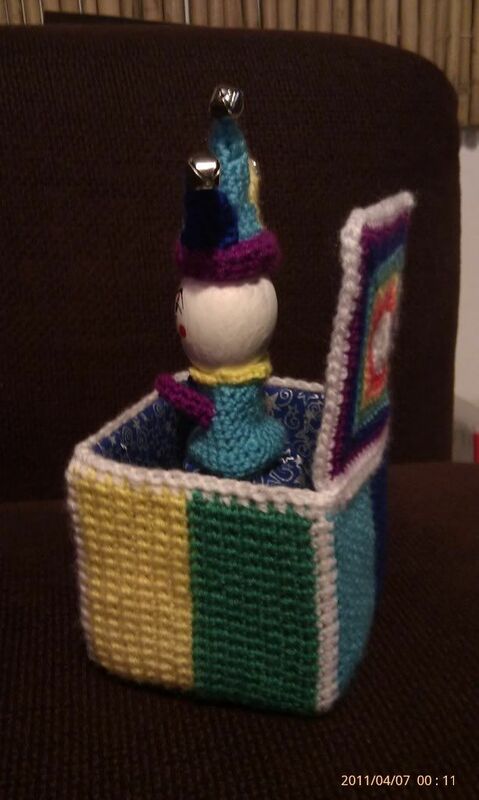 Use more tape to fix the card into a box with lid shape + check it fits into the crochet box. Trim card if necessary. Take the box out again to stick on the fabric. Fold the fabric into a box shape and glue it into the cardboard box, starting with the base. Cover base with PVA glue, stick on and smooth out base fabric. Apply glue to sides + repeat, folding seam allowances so that they leave neat edges and no gaps. Repeat with lid. Add extra glue where necessary + fold over any seam allowances that overlap the edges of the box so that the raw cardboard edges are all covered. 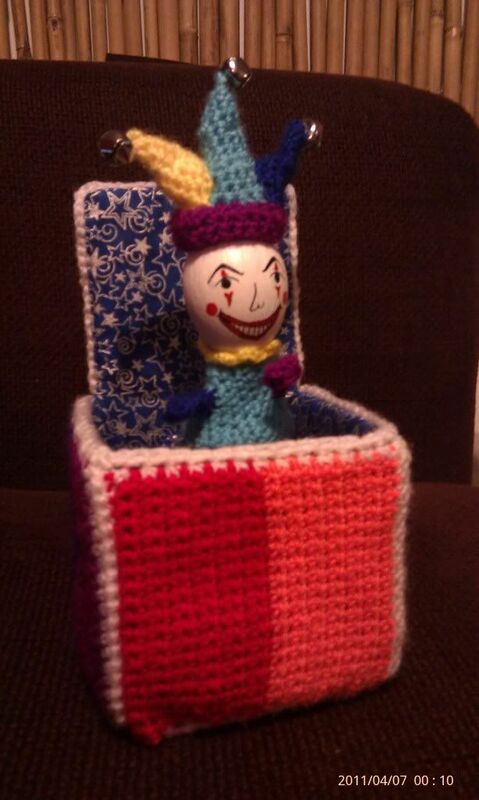 Now put the cardboard, fabric lined box into the crochet box. Take a needle and white thread (so that it doesn’t show against the white yarn edges), and sew the crochetted box edge to the fabric/card at the edge of the inner box. I did one stitch around the middle of each crochet stitch (not around the top edge), as this looked neatest and meant that the crochetted edges stuck up slightly in an attractive way to hide the inner box edge. Do this all the way around the lid and box edge. Start off by blowing the contents of the egg out. This is so that there’s nothing to go rotton and you can keep your creation for as long as you want to. Carefully use a skewer or small screwdriver to make a little hole in one end of an egg. Make another, slightly larger hole at the other end. Now blow into the small hole so that all the egg comes out of the larger hole. Run some water through the egg to rinse it out a bit. Now paint your egg white. 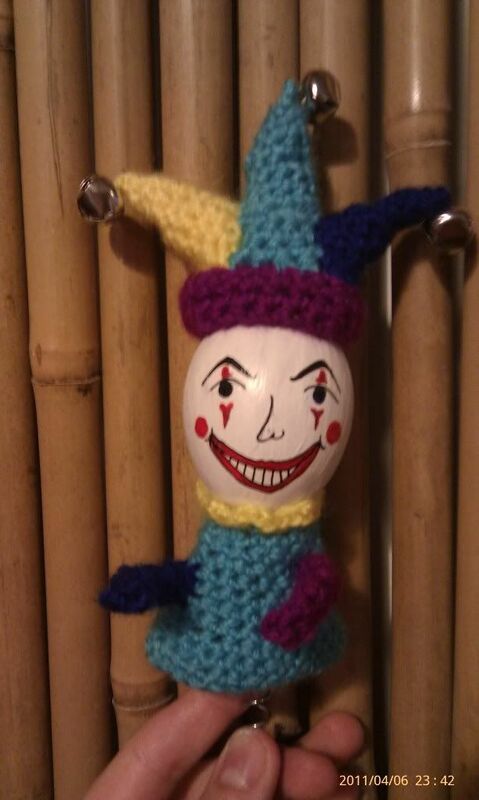 When dry, paint/draw with felt tips a joker/jester/clown face on the egg. 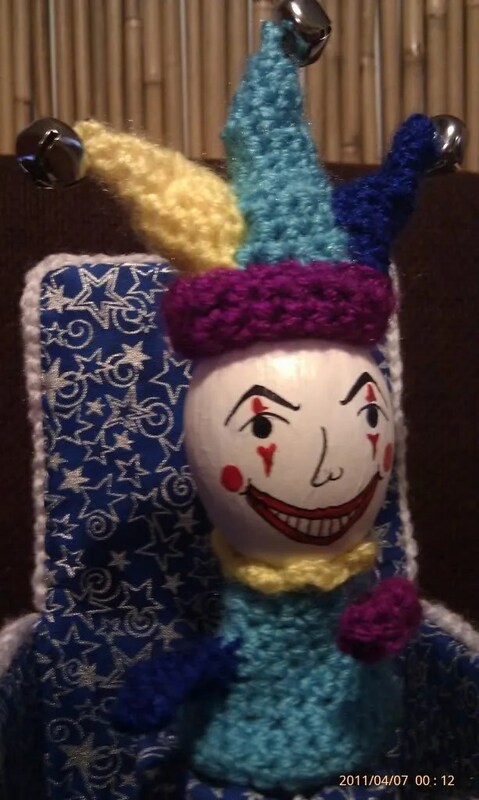 I’m using the fatter end of the egg as the top of the jester’s head; I used poster paints and highlighted the face in black felt tip pen. I then used a spray varnish to give it all a shinier finish. 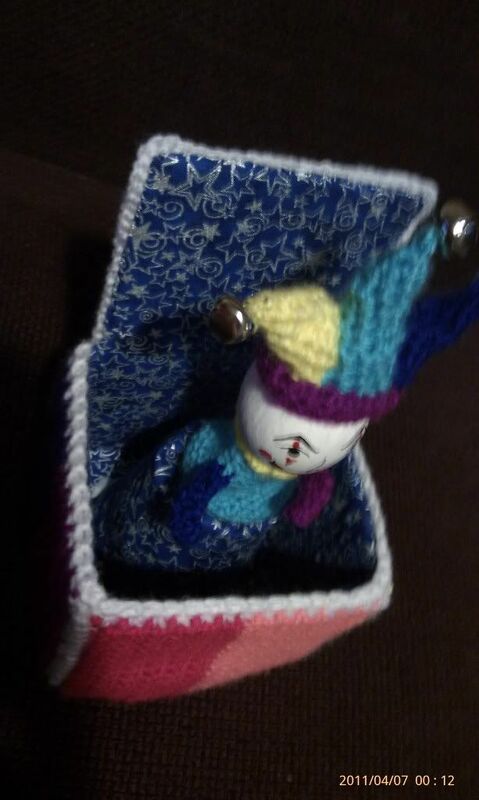 Realised that the box is too small to fit the Jester and his hat horizontally so no chance of closing the box and having him popping up. Hey ho, he still looks freaky enough for a primary school methinks! Glued small suction cup to bottom of egg and fitted spring end securely to it. Stabbed a hole in bottom and lid of a baby milk container + threaded the string through both holes, making sure that there was enough tension in the spring to hold the egg up. Cover the pot with PVA glue and wrap a piece of the lining fabric all around. Don’t glue the fabric at the top, instead just fold it up under the Jester’s ‘skirt’ so that he blends in to his support. Glue the pot into the box and wait for all that glue to dry…. 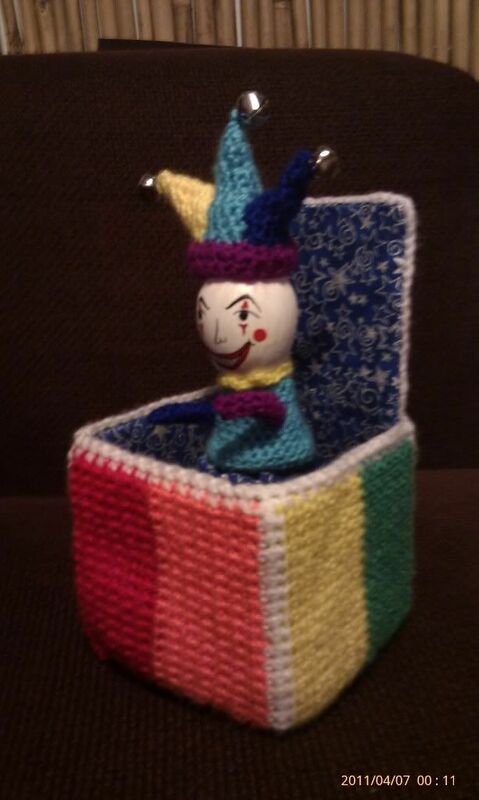 This entry was posted in Crafting, Crochet and tagged clown, crochet, crochetted, crochetted box, egg decorating, jack in the box, jester. Bookmark the permalink.